Soak rice and moong dal for 1 hour. Wash it well. Pressers cook with 3 cups of water, salt, and turmeric powder for 3 to 4 whistle or till cook. Let it cool down. Heat oil in pan, add mustard seeds, dry red chilly, garlic slices and sauté for ½ minute. Add onion, capsicum, carrots, salt, and turmeric powder and mix well. Cook for 2 to 3 minute. Add red chilly powder, coriander powder, cumin powder, mix well. Cook for 1 minute. Switch off the flame. Take serving plate, arrange moong dal khichadi. 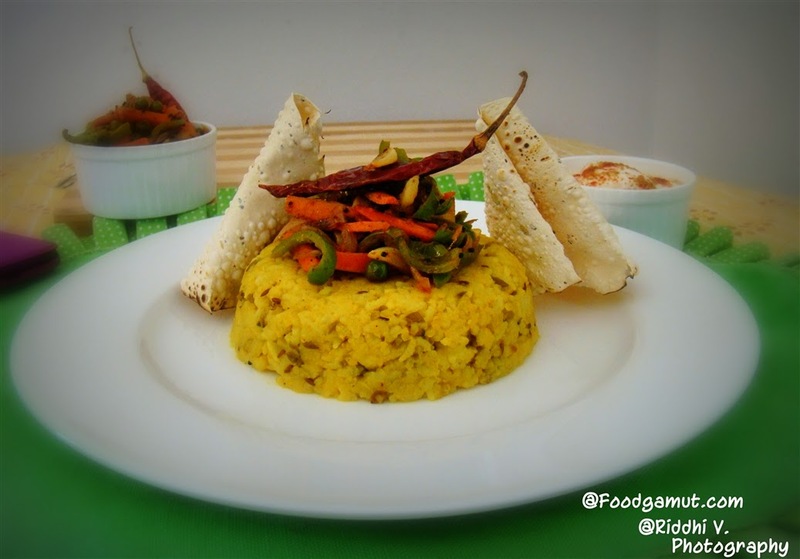 Arrange cooked vegetables over khichadi. Garnish with dry red chiily and garlic slice.